Ministering to someone who is grieving the loss of a pregnancy–especially if the pregnancy was in the very early stages where it is easy to keep it a secret–is a difficult task to face. The loss is unique; it’s difficult to understand if you’ve never experienced it yourself. It is often deprived of the closure of a memorial or funeral or even a grave. The connection between a mother and her unborn child is not easily observed or shared by a third party, and as a consequence the deep sorrow following a miscarriage often goes unaddressed and overlooked. Or, if the pregnancy hadn’t been announced, it is simply kept secret. How people handle the grief of an early miscarriage is as varied as the personalities of the people themselves, and so knowing what to say or do can be an enormous challenge, even for those who have experienced the same type of loss. But their need for prayer is universal, and their spiritual, emotional and mental needs are the same. I experienced my first miscarriage in the late autumn of 2007; after the birth of three healthy boys over the past three years, I am currently experiencing my second miscarriage at eight weeks of pregnancy. 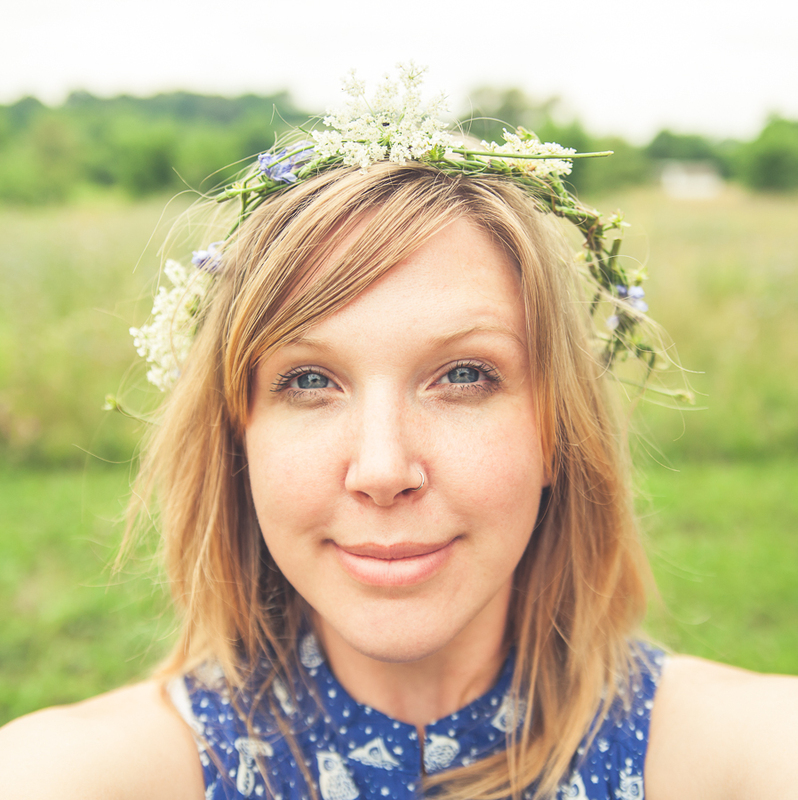 In considering the effects of my first loss, I’ve compiled a list of six things (or, five things and one admonition) to pray over the one who is suffering the early loss of a baby; things beyond the given requests for peace and comfort. Pray that they would grieve in truth. in my attempts to find a reason and clarification for what happened, I allowed myself to be consumed by untrue explanations that were straight from the Father of Lies himself. The common and well-meaning but unbelievably cruel maxim of “everything happens for a reason” frequently offered to the grieving was, for me, a springboard for the thought processes that invited the lies of the enemy to take root. Pray for the truth to remain at the forefront of their thoughts: that God is good; that He loves them; that He does not rejoice in their loss, but grieves with them; that He will cause this event to work for good. Pray that in their darkest moments they would be able to remember the times they clearly experienced the Goodness and Grace of God and find immeasurable comfort in that memory. Pray that their hearts would not be darkened. It is so easy for bitterness, fear, and anger to take root in grief. Then as time passes, the grief subsides as the darkness of fear and anger and bitterness grows and overtakes it. I remember vividly the day I realized I was nolonger felt sad over our miscarriage, but instead intensely angry at God and with everyone else that we had had to suffer it. That place of bitterness was a nightmare worse than the loss itself; it has taken years to become disentangled from it. Last night I lay awake thinking about what the next few days, months, and years may bring after our loss, and it was the thought of going back to that very dark place that filled me with anxiety and fear; I am afraid of that even more than the loss itself. Pray for discernment in the midst of grieving. Pray that the grieving process would be a season of strengthened faith. Pray for protection from the attacks of the enemy during this time of extreme vulnerability. Pray for the burden to be shared. My first miscarriage was, hands-down, the loneliest, most utterly solitary thing I have ever walked through. This was partially my fault–I’m a private person, and in the face of suffering I withdraw. Immediately after our loss, the very lst thing I wanted to do was talk about it. I went to the hospital for my D&C alone. I spent the next day in bed, recovering, alone. Then the following day I went back to work and tried to be normal. I was grateful for the people close to me that expressed condolences and then dropped the subject. I desperately wanted things to be normal again. I thought about the loss constantly, but strove not to mention it. It wasn’t long before I realized I had to talk to someone to be able to process, to be able to move on and deal with what I was feeling. But what I found was that I had missed my opportunity, and everyone else had moved on. Bringing up the subject of my loss brought a reaction of discomfort in most people, and some even reacted in anger and bewilderment that I was referring to it at all. Pray that the they would be able to share the burden with another person, and if they can’t find anyone, pray that that person would find them. Pray that they would not be blinded by pride from seeking help. Pray for strength and peace for the person who will carry the burden with them. Pray for the grace to submit. final stage of acceptance? I truly think it was years–probably not until well after the birth of Ephraim–that I was able to move past the stages of anger and bargaining over our miscarriage. The searching for reasons, the seeking that elusive answer to the ever-present “why?”, the heartbreaking “if only”, and the mehodical analysis of everything you might have done (or didn’t do) that could have caused the loss is overwhelming. The hardest thing but the best thing, the only thing that can really bring me rest and peace and acceptance, is submitting and letting go of those whys and what-ifs. I don’t think it’s something I can do on my own at all. Pray for the grace and the supernatural ability to accept what has come to pass. Pray for the early stages of grief, if they are necessary, to pass quickly. Pray for rest from the unrelenting questions of the unknown. Pray that those who speak to the grieving would have the wisdom to not give answers where there are none. Pray for the happy ending. It is extremely unlikely that I will ever know what caused our miscarriages. 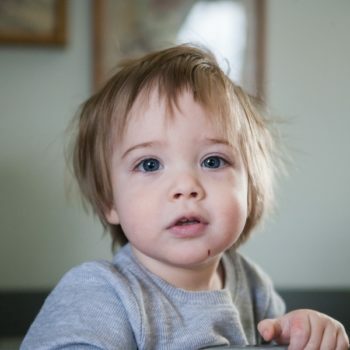 We had no genetic testing done with the first and won’t this time, either, so unless there is another loss in our future that somehow sheds light on the subject, we are currently in the dark. While we will not know the reasons behind it, we can be assured that these losses will be used for good. That this grief is not the end of the story. It may be days, months, years, or even decades, but what we’ve walked through will bring forth fruit–fruit that is sweet, not bitter. 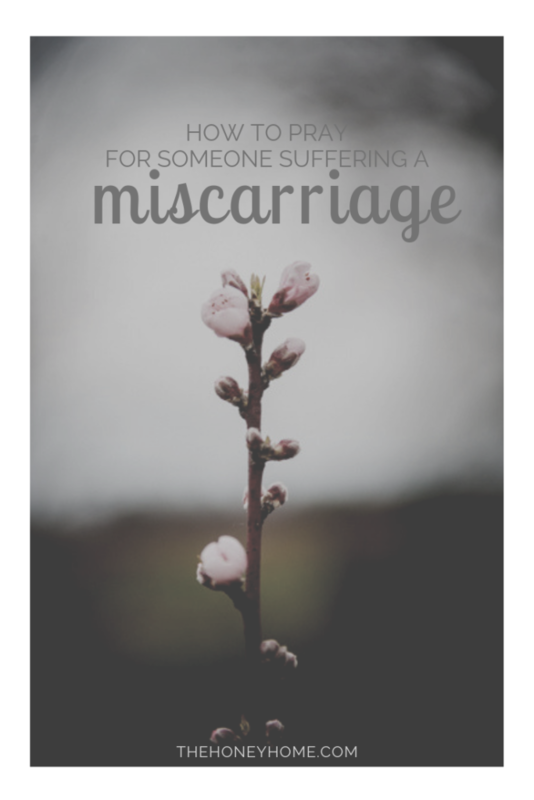 For our first miscarriage, one good is that my grief made me resolve to other intentionally in a way I don’t think I would have done had I never experienced that loss. For our second, there is this list of ways to pray; I am hoping it will encourage at least a few people who feel lost in regards to how to help their friends or family who are grieving. The rainbow baby, the ability to help others that grieve, the deepened relationship with God–pray for the good to come and be bold in asking it come quickly. It’s understandable, really, how quickly the outside world moves on after the initial sympathy shown for a miscarriage. To most people, the baby is more of an abstract idea than a reality. There is a huge disconnect between the unborn child and, well, everybody–except the mother and father. They have already spent hours, days, weeks or months dreaming about the child, speaking to the child, planning for the child, naming the child; there is a bond there, and the breaking of that bond through untimely death is excruciating. There is a general assumption that the grief will–or should–match the amount of time that the bond was formed over. This is simply not true. 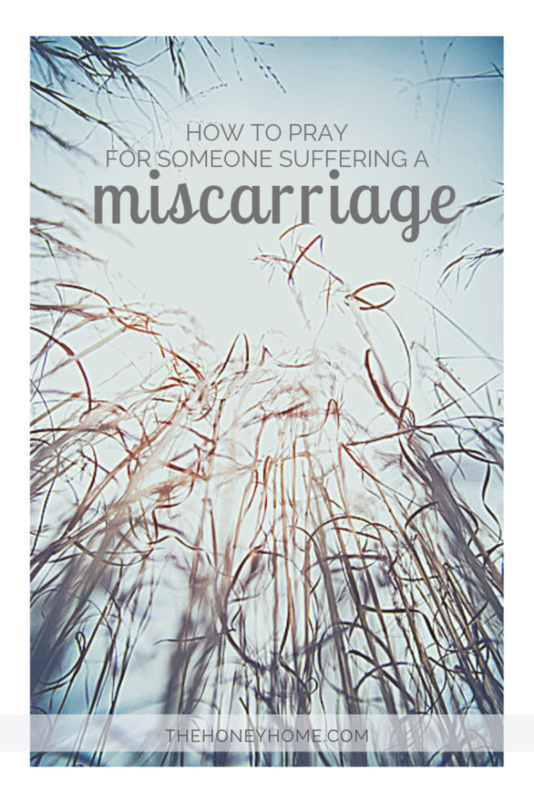 A miscarriage does not inspire grief for a few weeks that gradually dissipates before disappearing entirely. It is not something that a mother “gets over”. They may tell you they’re fine, but they don’t mean it in the way you think. They’re changed; things will never be the same. This is not the time to murmur a few words of peace and comfort and then believe that the time for prayer has passed. They will need your prayers as much in five years as they did the day they miscarried. This is not intended to sound hopeless–it is merely a fact of the gravity of the situation. Personally, I thought I was doing pretty well handling my grief until about a year following my miscarriage. That’s when I remember things taking a turn for the worst and spiraling into that bitter, angry darkness that enshrouded me for so long. I’m sure most people thought I was “over it” by then, when in reality the real mourning had just begun. Pray these things as often as you remember the parents mourning. Pray that God would continue to bring them to mind, to remind you to pray. Pray that others would do the same. Let them know you are praying for them, that you remember, that you haven’t forgotten what has been lost.